Audrey J. Weiss, Ph.D., Kimberly W. McDermott, Ph.D., and Kevin C. Heslin, Ph.D. This Healthcare Cost and Utilization Project (HCUP) Statistical Brief presents statistics on opioid-related hospitalizations among women aged 15 years and older using the 2016 National Inpatient Sample (NIS). The distribution of opioid-related stays by select patient and hospitalization characteristics is presented and contrasted with the distribution for non-opioid-related stays. The types of opioid diagnoses during hospitalization are also provided for select patient characteristics. Finally, rates of opioid-related stays are presented by patient characteristics. Differences greater than 10 percent between estimates are noted in the text. Figure 1 presents characteristics of opioid-related versus nonopioid-related stays among women in 2016. The rate of opioid-related stays among women in 2016 was 374.8 per 100,000 population. The rate increased with women's age, decreased with community-level income, and was highest for White women, followed by Black women. Most opioid-related stays among women aged 15-44 years involved abuse/dependence (86 percent). Nearly half of opioid stays among women aged 65 years and older were due to adverse events. Nearly 1 in 10 opioid stays among women aged 45-64 years involved self-harm (more than other age groups). Regardless of income level, White women had the highest rate of opioid-related stays, followed by Black women, but the difference between White and Black women decreased from 34 percent higher for White women in the lowest income quartile to 17 percent higher in the highest income quartile. In large metropolitan areas, White and Black women had a similar rate of opioid-related stays. However, in rural areas, Black women had a lower rate of opioid stays compared with White women. Regardless of age group, the rate of opioid-related stays was lowest among women who resided in the West South Central division. The rate of opioid-related stays was higher among older women in the western and north central United States but higher among younger women in the northeastern United States. 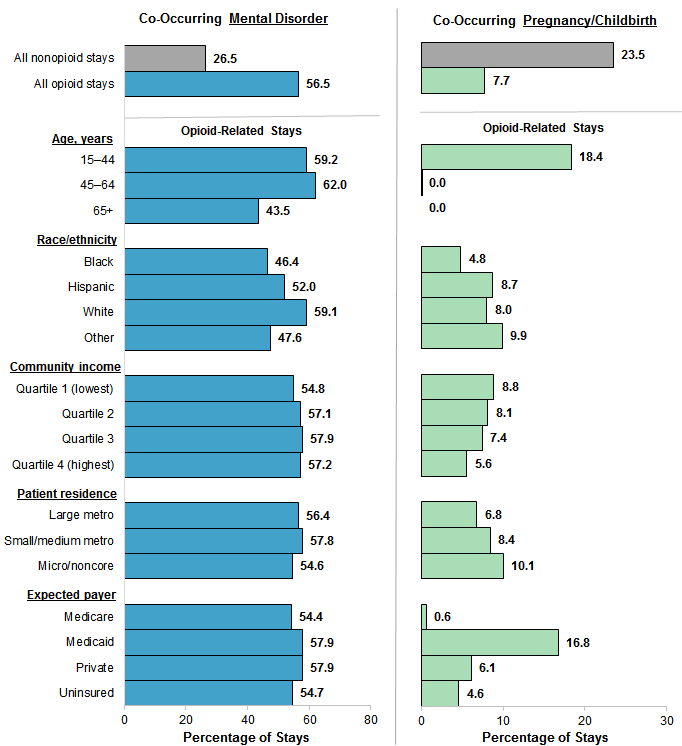 Bar chart that shows percentage of age, race/ethnicity, community income, patient residence, and expected payer characteristics of opioid-related and non-opioid-related inpatient stays among women in 2016. Data are provided in Supplemental Table 1. A higher percentage of opioid-related stays than nonopioid stays were among younger women, White women, and women with Medicaid or who were uninsured. Compared with non-opioid-related stays, a higher percentage of opioid-related stays involved women aged 15-44 years (42.0 vs. 37.0 percent) and 45-64 years (34.9 vs. 23.5 percent), White women (73.3 vs. 62.8 percent), and women with stays billed to Medicaid (35.7 vs. 21.0 percent) or whose stays were not expected to be covered by insurance ("uninsured"; 5.0 vs. 3.2 percent). A lower percentage of opioid-related stays than nonopioid stays were among older women, racial/ethnic minority women, women in the highest income quartile, and women with Medicare or private insurance. Compared with non-opioid-related stays, a lower percentage of opioid-related stays involved women aged 65 years and older (23.1 vs. 39.5 percent). Non-White women also constituted a lower percentage of opioid-related than non-opioid-related stays (Black: 12.5 vs. 14.9 percent; Hispanic: 6.2 vs. 11.4 percent; Other race/ethnicity: 3.6 vs. 6.5 percent). A lower percentage of opioid-related than nonopioid stays were among women who resided in the highest income quartile (16.9 vs. 19.5 percent) and women who with stays billed to Medicare (38.3 vs. 43.3 percent) or private insurance (18.5 vs. 30.0 percent). There were no noteworthy differences by patient residence location. Figure 2 presents the percentage of opioid-related stays among women with a co-occurring mental disorder or pregnancy/childbirth by patient characteristics in 2016. The percentage of non-opioid-related stays with a co-occurring mental disorder or pregnancy/childbirth is provided across all patient subgroups at the top, for comparison. Notes: Mental disorder included a range of mental disorders and related diagnoses (e.g., anxiety, bipolar, depressive, personality, schizophrenia, somatic, and suicidal ideation/attempt); see the separate appendix (www.hcup-us.ahrq.gov/reports/statbriefs/sb247-appendix.pdf) for a full list of diagnosis codes used. Pregnancy/childbirth was defined using Major Diagnostic Category 14 (pregnancy, childbirth, and puerperium). Bar chart that shows opioid-related inpatient stays among women with a co-occurring mental health diagnosis or pregnancy/childbirth by patient characteristics in 2016. Data are provided in Supplemental Table 2. The percentage of stays involving a co-occurring mental disorder was more than twice as high for opioid-related stays as for nonopioid stays. More than half of opioid-related stays involved a mental disorder (56.5 percent) compared with only one-fourth of non-opioid-related stays (26.5 percent). The percentage of opioid-related stays with a co-occurring mental disorder was higher among younger women (aged 15-44 years: 59.2 percent; aged 45-64 years: 62.0 percent) than among women aged 65 years and older (43.5 percent). A higher percentage of opioid stays among White women also involved a co-occurring mental disorder (59.1 percent) compared with other racial/ethnic groups (range: 46.4-52.0 percent, depending on the group). Nearly one in five opioid-related stays among women of reproductive age involved co-occurring pregnancy/childbirth. Among women aged 18-44 years, 18.4 percent of opioid-related stays involved co-occurring pregnancy/childbirth. Co-occurring pregnancy/childbirth with opioid-related stays was more common among women with Medicaid and less common among Black women, women in higher income areas, and women residing in large metropolitan areas. Compared with non-opioid-related stays, the percentage of opioid-related stays that involved a co-occurring pregnancy/childbirth was one-third as high (7.7 vs. 23.5 percent). Women with stays billed to Medicaid had the highest percentage of co-occurring pregnancy/childbirth (16.8 percent vs. 0.6-6.1 percent for other payer types). The percentage of opioid-related stays involving a co-occurring pregnancy/childbirth was lower among Black women (4.8 percent) than among women of other races/ethnicities (8.0-9.9 percent). The percentage of opioid-related stays with a co-occurring pregnancy/childbirth decreased with community-level income, from 8.8 percent in the lowest income quartile to 5.6 percent in the highest income quartile. Conversely, the percentage of opioid-related stays with a co-occurring pregnancy/childbirth increased with rurality of patient residence location, from 6.8 percent in large metropolitan areas to 10.1 percent in micropolitan/noncore areas. Figure 3 presents the distribution of the type of opioid diagnosis (abuse/dependence, adverse event, or poisoning/self-harm) for opioid-related stays among women by patient characteristics in 2016. Note: Some discharges included more than one opioid diagnosis type. For this figure, discharges were categorized into only one opioid diagnosis type category using the following hierarchy: abuse/dependence, adverse effect, and poisoning/self-harm. 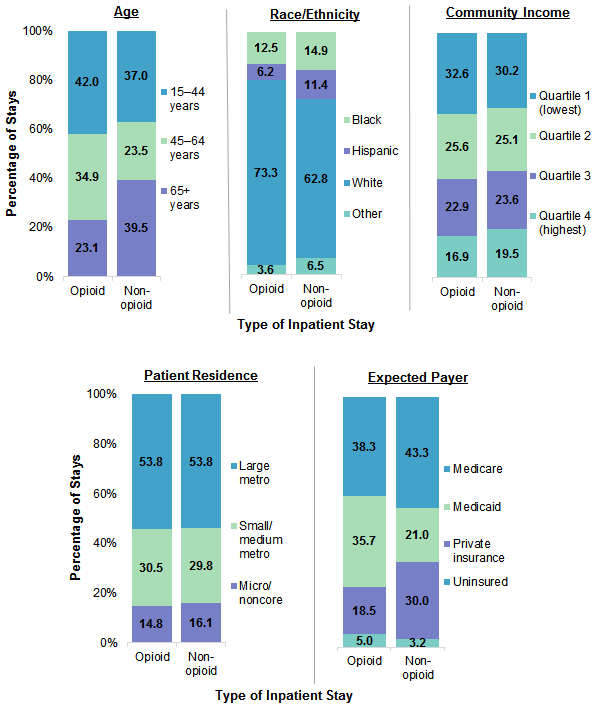 Bar chart that shows the percentage of opioid-related inpatient stays among women for opioid abuse-dependence, opioid adverse event, and opioid poisoning/self-harm in 2016. Data are provided in Supplemental Table 3. The percentage of opioid-related stays with an opioid abuse/dependence diagnosis decreased with age, whereas the percentage of stays with an opioid adverse event diagnosis increased with age. The percentage of opioid-related stays with an opioid abuse/dependence diagnosis decreased with age, from 86.4 percent for women aged 15-44 years to 42.2 percent for women aged 65 years and older. Conversely, the percentage of opioid stays with an opioid adverse event diagnosis increased with age, from 8.7 percent for women aged 15-44 years to 49.8 percent for women aged 65 years and older. The percentage of opioid-related stays with an opioid abuse/dependence diagnosis decreased with income, whereas the percentage of stays with an opioid adverse event diagnosis increased with income. The percentage of opioid-related stays with an opioid abuse/dependence diagnosis decreased with community-level income, from 75.2 percent for women residing in the lowest income communities to 64.4 percent for women residing in the highest income communities. Conversely, the percentage of opioid stays with an opioid adverse event diagnosis increased with income, from 17.4 percent for women residing in the lowest income communities to 29.6 percent for women residing in the highest income communities. The percentage of opioid-related stays with an opioid abuse/dependence diagnosis was higher for women with Medicaid or who were uninsured, whereas the percentage of stays with an opioid adverse event diagnosis was higher for women with Medicare or private insurance. The percentage of opioid-related stays with an opioid abuse/dependence diagnosis was higher for women with Medicaid or who were uninsured (87.0 and 82.6 percent, respectively) than for women with Medicare or private insurance (57.3 and 63.2 percent, respectively). Conversely, the percentage of opioid stays with an opioid adverse event diagnosis was higher for women with Medicare or private insurance (34.1 and 29.2 percent, respectively) than for women with Medicaid or who were uninsured (8.0 and 8.6 percent, respectively). Figure 4 presents the rate per 100,000 population of opioid-related stays among women overall and by age, race/ethnicity, community-level income, and patient residence in 2016. Bar chart that shows the rate of opioid-related inpatient stays among women per 100,000 population by patient characteristics in 2016. Data are provided in Supplemental Table 4. The rate of opioid-related hospitalizations increased with patient age and decreased with community-level income. Overall the rate of opioid-related stays was 374.8 per 100,000 population. The rate of opioid stays was higher among older patients aged 65+ years and aged 45-64 years (426.7 and 405.0 per 100,000 population, respectively) than among patients aged 15-44 years (332.0 per 100,000 population). The rate of opioid-related stays decreased with community-level income, from 484.6 per 100,000 population in the lowest income quartile to 252.2 per 100,000 in the highest income quartile. The rate of opioid-related stays was higher among White women than among women of other races/ethnicities. The rate of opioid-related hospitalizations was highest among White women (428.3 per 100,000 population), followed by Black women (379.8 per 100,000 population). The rate was less than half as high among Hispanic women or women of other races/ethnicities (152.2 and 164.1 per 100,000 population, respectively). Figure 5 presents the rate per 100,000 population of opioid-related stays among women by community-level income quartile and race/ethnicity in 2016. 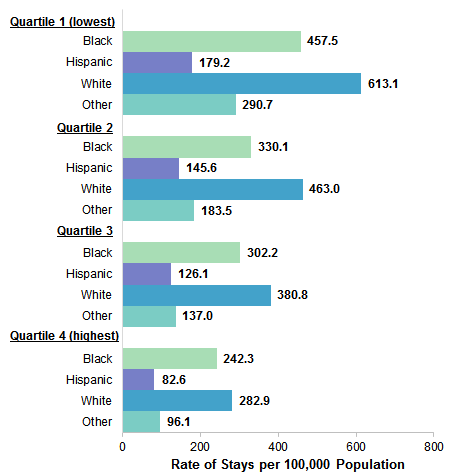 Bar chart that shows the rate of opioid-related inpatient stays per 100,000 population among women by community-level income quartile and race/ethnicity in 2016. Data are provided in Supplemental Table 5. The rate of opioid-related stays among women decreased by income quartile for each racial/ethnic group. Across racial/ethnic groups, the rate of opioid-related stays among women decreased as community-level income increased. For instance, among White women, the rate decreased from 613.1 per 100,000 population in the lowest income quartile to 282.9 per 100,000 population in the highest income quartile. Regardless of income quartile, White women had the highest rate of opioid-related stays. For each income quartile, White women had the highest rate of opioid-related stays compared with other racial/ethnic groups. Black women had the second highest rate of opioid stays in each income quartile. Notably, the difference between White and Black women decreased as community-level income increased, from a 34 percent difference between White and Black women in the lowest income quartile (613.1 vs. 457.5 per 100,000 population) to a 17 percent difference between White and Black women in the highest income quartile (282.9 vs. 242.3 per 100,000 population). Figure 6 presents the rate per 100,000 population of opioid-related stays among women by patient residence and race/ethnicity in 2016. 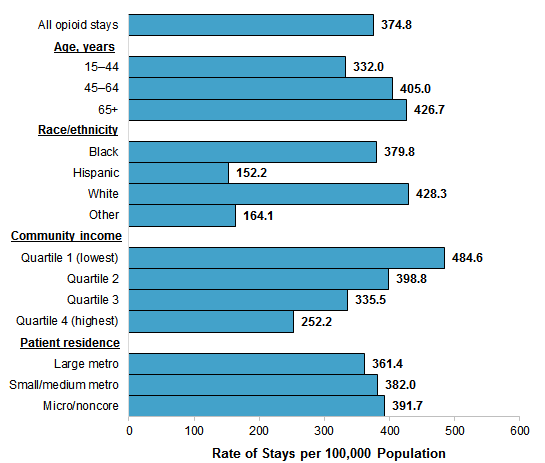 Bar chart that shows the rate of opioid-related inpatient stays per 100,000 population among women by patient residence and race/ethnicity in 2016. Data are provided in Supplemental Table 5. White women had a consistently high rate of opioid-related stays across patient residence type, but the rate of stays for Black women was higher in urban areas than in rural areas. Regardless of patient residence, White women had the highest rate of opioid-related stays compared with other racial/ethnic groups, at over 400 stays per 100,000 population. In large metropolitan areas, the rate of stays was similar for White and Black women (433.9 and 424.8 per 100,000 population, respectively). However, as the rurality of patient residence increased, White women continued to have high rates of opioid-related stays, whereas Black women had lower rates of opioid stays (e.g., 208.8 per 100,000 population in micropolitan and noncore areas). 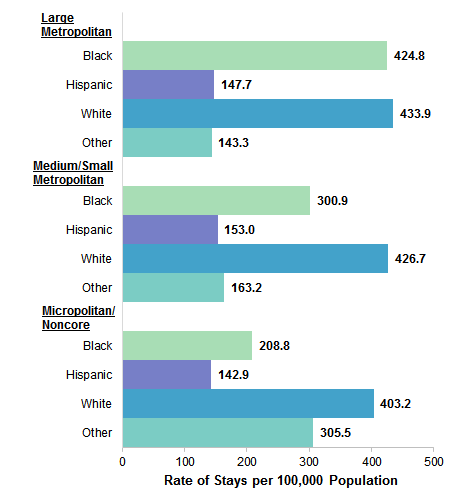 In micropolitan/noncore areas, women of "Other" race/ethnicity had the second highest rate of opioid-related stays (305.5 per 100,000 population) behind White women (403.2 per 100,000 population). Figure 7 provides the population rate of opioid-related inpatient stays among women aged 15-44 years, 45-64 years, and 65 years and older by U.S. census division in 2016. The ratio of each census division rate to the national rate also is provided in the figure and is reflected in the color-coding of the maps. The West South Central division had the lowest rate of opioid stays among women. The rate of opioid-related stays among women in the West South Central division was more than 30 percent lower than the national population rate for all three age groups. 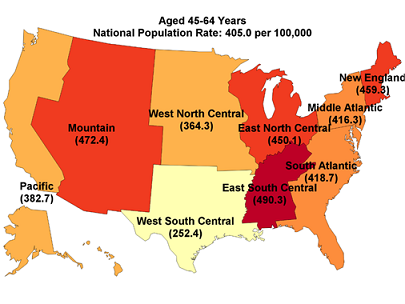 The rate of opioid stays increased with age in the Pacific, Mountain, and West North Central divisions. In the western and north central United States, the rate of opioid stays was lower among younger women and higher among older women. For instance, in the Pacific division, women aged 15-44 years had a rate of opioid stays that was more than 50 percent lower than the national rate, whereas women aged 65 years and older had a rate of opioid stays that was more than 25 percent higher than the national rate. The rate of opioid stays decreased with age in the New England, Middle Atlantic, and East North Central divisions. In the northeastern United States, the rate of opioid stays was higher among younger women and lower among older women. For instance, in the Middle Atlantic division, women aged 15-44 years had a rate of opioid stays that was more than 25 percent higher than the national rate, whereas women aged 65 years and older had a rate of opioid stays that was more than 20 percent lower than the national rate. Three maps, one for each age group, that show the population rate per 100,000 of opioid-related inpatient stays among women by census division in 2016. The maps are color coded to show the ratio of the census division rate to the national rate. Aged 15-44 years: National, 332.0; Pacific, 214.9; Mountain, 303.1; West North Central, 289.2; West South Central, 165.9; East South Central, 523.8; South Atlantic, 353.5; East North Central, 407.0; Middle Atlantic, 418.9; New England, 518.0. Ratio of census division rate to national rate: New England, Middle Atlantic, East North Central, East South Central, >1.20; South Atlantic, 1.00-1.09; Mountain, 0.90-0.99; West North Central, 0.80-0.89; Pacific, West South Central; <0.80. Aged 45-65 years: National, 405.0; Pacific, 382.7; Mountain, 472.4; West North Central, 364.3; West South Central, 252.4; East North Central, 450.1; East South Central, 490.3; South Atlantic, 418.7; Middle Atlantic, 416.3; New England, 459.3. 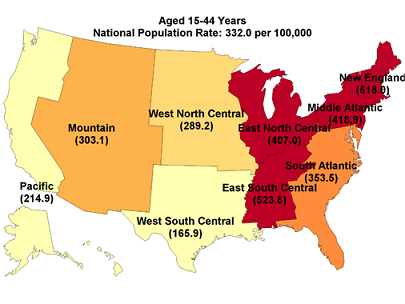 Ratio of census rate to national rate: East South Central, >1.20; New England, East North Central, Mountain, 1.10-1.19; Middle Atlantic, South Atlantic, 1.00-1.09; West North Central, Pacific, 0.90-0.99; West South Central, <0.80. 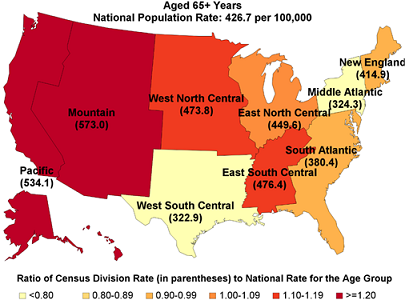 Aged 65+ years: Pacific, 534.1; Mountain, 573.0; West North Central, 473.8; West South Central, 322.9; East South Central, 476.4; East North Central, 449.6; South Atlantic, 380.4; Middle Atlantic, 324.3; New England, 414.9. Ratio of census rate to national rate: Pacific, Mountain, >1.20; West North Central, East South Central, 1.10-1.19; East North Central, 1.00-1.09; New England, South Atlantic, 0.90-0.99; West South Central, Middle Atlantic <0.80. Healthcare Cost and Utilization Project (HCUP) Statistical Briefs provide basic descriptive statistics on a variety of topics using HCUP administrative health care data. Topics include hospital inpatient, ambulatory surgery, and emergency department use and costs, quality of care, access to care, medical conditions, procedures, and patient populations, among other topics. The reports are intended to generate hypotheses that can be further explored in other research; the reports are not designed to answer in-depth research questions using multivariate methods. ICD-10-CM/PCS is the International Classification of Diseases, Tenth Revision, Clinical Modification/Procedure Coding System. In October 2015, ICD-10-CM/PCS replaced the ICD-9-CM diagnosis coding system with the ICD-10-CM diagnosis coding system for most inpatient and outpatient medical encounters. There are over 70,000 ICD-10-CM diagnosis codes. MDCs assign ICD-10-CM principal diagnosis codes to 1 of 25 general diagnosis categories. Opioid-related hospital use was identified using the all-listed ICD-10-CM diagnosis codes shown in Table 1. Co-occurring mental disorders were defined using the ICD-10-CM codes provided in the separate appendix associated with this Statistical Brief on the HCUP-US website at www.hcup-us.ahrq.gov/reports/statbriefs/sb247-appendix.pdf. Co-occurring pregnancy/childbirth was defined as MDC 14 (pregnancy, childbirth and puerperium). Community-level income is based on the median household income of the patient's ZIP Code of residence. Quartiles are defined so that the total U.S. population is evenly distributed. Cut-offs for the quartiles are determined annually using ZIP Code demographic data obtained from Claritas, a vendor that adds value to data from the U.S. Census Bureau.11 The value ranges for the income quartiles vary by year. The income quartile is missing for patients who are homeless or foreign. Data on Hispanic ethnicity are collected differently among the States and also can differ from the census methodology of collecting information on race (White, Black, Asian/Pacific Islander, American Indian/Alaska Native, Other [including mixed race]) separately from ethnicity (Hispanic, non-Hispanic). State data organizations often collect Hispanic ethnicity as one of several categories that include race. Therefore, for multistate analyses, HCUP creates the combined categorization of race and ethnicity for data from States that report ethnicity separately. When a State data organization collects Hispanic ethnicity separately from race, HCUP uses Hispanic ethnicity to override any other race category to create a Hispanic category for the uniformly coded race/ethnicity data element, while also retaining the original race and ethnicity data. This Statistical Brief reports race/ethnicity for the following categories: Hispanic, non-Hispanic White, non-Hispanic Black, and other race/ethnic groups (which includes Asian/Pacific Islander, American Indian/Alaska Native, and non-Hispanic Other). The HCUP National (Nationwide) Inpatient Sample (NIS) is a nationwide database of hospital inpatient stays. The NIS is nationally representative of all community hospitals (i.e., short-term, non-Federal, nonrehabilitation hospitals). The NIS includes all payers. It is drawn from a sampling frame that contains hospitals comprising more than 95 percent of all discharges in the United States. The vast size of the NIS allows the study of topics at the national and regional levels for specific subgroups of patients. In addition, NIS data are standardized across years to facilitate ease of use. Over time, the sampling frame for the NIS has changed; thus, the number of States contributing to the NIS varies from year to year. The NIS is intended for national estimates only; no State-level estimates can be produced. The unweighted sample size for the 2016 NIS is 7,135,090 (weighted, this represents 35,675,421 inpatient stays). For other information on mental and substance abuse disorders, refer to the HCUP Statistical Briefs located at www.hcup-us.ahrq.gov/reports/statbriefs/sb_mhsa.jsp. Agency for Healthcare Research and Quality. Overview of the National (Nationwide) Inpatient Sample (NIS). Healthcare Cost and Utilization Project (HCUP). Rockville, MD: Agency for Healthcare Research and Quality. Updated February 2018. www.hcup-us.ahrq.gov/nisoverview.jsp. Accessed February 12, 2018. Weiss AJ (IBM Watson Health), McDermott KW (IBM Watson Health), Heslin KC (AHRQ). Opioid-Related Hospital Stays Among Women, 2016. HCUP Statistical Brief #247. January 2019. Agency for Healthcare Research and Quality, Rockville, MD. www.hcup-us.ahrq.gov/reports/statbriefs/sb247-Opioid-Hospital-Stays-Women.pdf. This Statistical Brief was posted online on January 22, 2019. 1 Centers for Disease Control and Prevention. Prescription Painkiller Overdoses: A Growing Epidemic, Especially Among Women. Updated September 4, 2018. https://www.cdc.gov/vitalsigns/prescriptionpainkilleroverdoses/index.html. Accessed December 10, 2018. 2 U.S. Food and Drug Administration. Women and Pain Medicines. Updated October 1, 2018. https://www.fda.gov/ForConsumers/ByAudience/ForWomen/WomensHealthTopics/ucm621707.htm. Accessed December 10, 2018. 3 Weiss AJ, Bailey MK, O'Malley L, Barret ML, Elixhauser A, Steiner CA. Patient Characteristics and Opioid-Related Inpatient Stays and Emergency Department Visits Nationally and by State, 2014. HCUP Statistical Brief #224. June 2017. Agency for Healthcare Research and Quality, Rockville, MD. www.hcup-us.ahrq.gov/reports/statbriefs/sb224-Patient-Characteristics-Opioid-Hospital-Stays-ED-Visits-by-State.pdf. Accessed September 26, 2018. 4 Mack KA, Jones CM, Paulozzi LJ. Vital signs: overdoses of prescription opioid pain relievers and other drugs among women—United States, 1999-2010. Morbidity and Mortality Weekly Report. 2013;62(26):537-42. 5 Weiss et al., 2017. Op.cit. 6 Frenk SM, Porter KS, Paulozzi LJ. Prescription Opioid Analgesic Use Among Adults: United States, 1999-2012. NCHS Data Brief #189. February 2015. Centers for Disease Control and Prevention. www.cdc.gov/nchs/data/dataBriefs/db189.pdf. Accessed September 26, 2018. 7 Seth P, Scholl L, Rudd RA, Bacon S. Overdose deaths involving opioids, cocaine, and psychostimulants—United States, 2015-2016. Morbidity and Mortality Weekly Report. 2018;67(12):349-58. 8 Campbell CI, Weisner C, LeResche L, Ray T, Saunders K, Sullivan MD, et al. Age and gender trends in long-term opioid analgesic use for noncancer pain. American Journal of Public Health. 2010;100(12):2541-7. 9 Ailes EC, Dawon AL, Lind JN, Gilboa SM, Frey MT, Broussard CS, et al. Opioid prescription claims among women of reproductive age—United States, 2008-2012. Morbidity and Mortality Weekly Report. 2015;64(2):37-41. 10 Claritas. Claritas Demographic Profile by ZIP Code. https://claritas360.claritas.com/mybestsegments/. Accessed June 6, 2018. Internet Citation: Statistical Brief #247. Healthcare Cost and Utilization Project (HCUP). January 2019. Agency for Healthcare Research and Quality, Rockville, MD. www.hcup-us.ahrq.gov/reports/statbriefs/sb247-Opioid-Hospital-Stays-Women.jsp.